The characters of Monsters University have been popping up in various TV spots as well as national commercials over the last week and they've been doing everything from playing hacky sack with Ms. Squibbles to cleaning up messes in the Oozma Kappa house. In the first commercial, for Swiffer WetJet, you'll see Squishy get nervous after a spill happens...and Ms. Squibbles has just cleaned the house! Mike eases everyone's nerves by filling them in that the Swiffer WetJet will take care of the mess...but we also find out that Ms. Squibbles might not have cared about the mess after all. 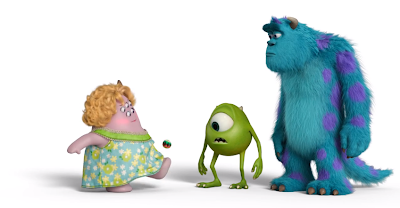 Do you know which monster from Monsters University is the best at playing hacky sack? We would have guessed Art - however, in this short TV clip (posted by Pixarblog) it seems that Ms. Squibbles is the hacky sack champion! Although we are many years removed from college this clip featured such a relatable college activity, and definitely took us back to our campus quad.